The senior Editor of the Watertown Republican is fearful that he is fated to live his life and depart “without making any sign” – that he be the first and last of his house. A tinge of despair comes over his dreams as he meditates on the lessening prospect of leaving any one after him . . . he sadly murmurs to himself and tearfully asks himself what is more worthy of the noblest and purest affections than one’s own children – if you have any – and he has not, and that is the aching void he wants filled . . . .
On the West side of the river resides a poor but respectable family consisting of nine small children, with a fair probability that the group will shortly number an even ten. This fatherless and childless Editor should speak with all possible hast for the one that will soon be the youngest. How his heart’s desire would be fulfilled! – Watertown Democrat. Last Tuesday, in company with Mr. J. T. Moak of the Watertown Republican, we started on an excursion to La Crosse to attend the Seventh Annual Session of the Wisconsin Editorial Association. The weather was warm and sunny, the widespread and waving fields and forests were arrayed in their brightest June dress of foliage and flowers. We had a pleasant journey both going and returning, an agreeable visit to the principal city in the northwestern portion of our state, and a delightful excursion up the Mississippi as far as Minneiska, on the splendid steamer Itaska and back again on board the equally fine boat Key City. We passed through a country rich, fertile, thickly settled and well cultivated for the most part and the crops of every kind appeared fine and promising. As we approached Portage City the soil gradually changed from a clayer to a sandy character and is not so valuable and productive. When we reached Sparta we again found ourselves in the midst of a fine and prolific section . . .
La Crosse is an active, enterprising and flourishing city with many beautiful and tasteful residences, surrounded by graceful shrubbery and blooming gardens . . . So far as Wisconsin is concerned, La Crosse is evidently destined to be the chief and largest city on this side of the mighty and far wandering stream which flows so majestically onward along its borders . . . 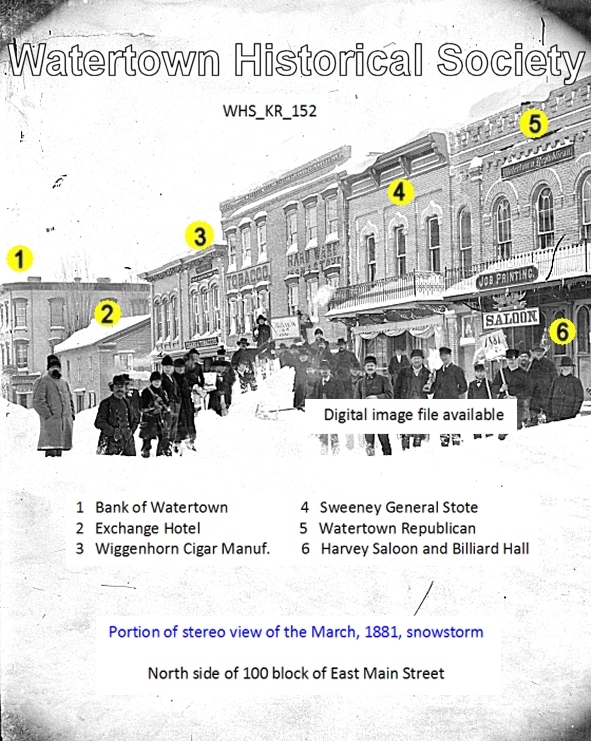 Vivid and graphic descriptions had made us familiar with the magnificent and glorious scenery we were for the first time to see for ourselves – as written or spoken words could convey to the mind – but the reality surpassed all our preconceived impressions and quickly dissolved all the airy visions of fancy . . . . – Editor, Watertown Democrat. D. W. Ballou – Will you allow me room in your column to say a few words in reply to the Republican of the 4th in which it personally assails the supervisor of the 3rd district? The article in question does not even make a point of grievance, or set forth any claim that it has in any manner been wronged by the party it assails, but is made up of scurrility and personalities entirely. The contemptible “pup” or “pups” who will write and publish an article of that character will rob you of your clothes line, pilfer your poultry, steal the pennys from the eyes of the dead, unless closely watched; and stealing from the County is only a pastime to such debased and infamous characters, provided they are permitted to do it. To all right thinking minds the article carries the weight of argument for its own refutation. The scum that presents itself upon the surface points unerringly to the slough beneath. The imaginary reason for the article is supposed to be the action of the Board which can be found in its published proceedings. The “pup” that conducts the Republican wrote to me in November last, asking the Union members to give him the printing of the Journal at $100. He informed D. Ostrander that he would do it for $60, rather than to have it go into other hands. He finally concluded it would be a capital idea to set a trap, catch the Board and make a steal from the County $75. He procured his accomplice “pup” to bid $175 and himself $150. Last Tuesday “pup” came down to get the “spoils” and learned to his great sorrow that instead of catching the Board he had caught himself in his own trap, and he may now be seen behind the bars and bolts howling and railing at the Supervisor of the 3rd district because the Board won’t use a hundred and fifty dollar lever to help him out . . .
1867 Justus Moak was appointed postmaster in 1867 by President Andrew Johnson and held the office during the succeeding administrations of Presidents Grant, Hayes, Garfield and Arthur. He was relieved by President Cleveland and reappointed by President Harrison, retiring about one year after the commencement of President Cleveland’s second term, making his service as postmaster cover a period of 23 years. While postmaster Mr. Moak made the postal service a careful, practical study, bringing it up to the dignity of a profession in Watertown, making that office a model for neatness and accuracy. He was an excellent authority upon all subjects pertaining to postal laws, rules and regulations. Quite a number of young men have graduated under his tutorship and are now holding important and responsible positions in various branches of the service, and he had a host of friends throughout the state and nation who sincerely regret his death. When J. T. Moak received the appointment of postmaster, William Voss became his deputy. The dull, monotonous condition of the city, as is usual at this season of the year, is being enlivened to a slight extent by a highly interesting story on "Bolting Republicans." "Inconsistencies" and "Vagaries" have had their turn at the wheel, and now the "sub-editor" is receiving the compliments of the wily and astute individual who is sailing under the sobriquet of "Felix." "Felix" also returns, like a dog to his vomit, to an attack on this paper. He incidentally calls attention to what he is pleased to term the "obtuseness,*of the sub- editor. The sub-editor will not undertake to deny the soft impeachment, but is sharp enough, at least, to see through "Felix," and well knows the reason for his impotent attack on The Republican. Fred Schmiedemann, who was foreman of The Republican office during the early ‘80’s, and who since has seen a very large part of North America, surprised his many Watertown friends by dropping in on them Friday last. He recently returned from Alaska, where he has been engaged in prospecting since the gold fever broke out. At first he was located in the Klondike country, but gave up his claims there in preference to becoming a British subject. Later he struck the Cape Nome district and expects to again be there when spring opens. Fred is enthusiastic over the prospects of that country and considers it a fine place to make money. He has with him a liberal supply of Alaskan gold dust, just as an evidence of the truth of his convictions. The Republican desires a correspondent in every rural route leading out of this city. It is the intention of the publishers of the weekly Republican to make it of value to the farming community and a welcomed visitor to every farm home adjacent to the city of Watertown. Application for postage and stationery can be made at the office either in person or by mail and arrangements made with correspondents to act as upon a liberal basis. 04 06 With the current issue of this paper, which heretofore has been known as The Watertown Republican, the name is changed to that of the Watertown Leader, under which heading it will be published in the future. For nearly forty-six years it was known by the name discarded and it is with considerable regret on the part of the publishers that the change was made. It is simply and solely a business proposition to meet conditions that made the change necessary for the financial success of the paper. Its policy and political sentiments will continue in the future to be the same as they have been in the past, an earnest advocate for good government and high moral ideals in civic and social life. The paper has been greatly improved under the present management and nothing will be left undone to make it a mirror of the best thought in the city and surrounding country. “If our dairy butter may be colored, to be made attractive with that rare goldness, why [can] the pure food law restrict the coloring of other things?” — Racine Daily Journal. 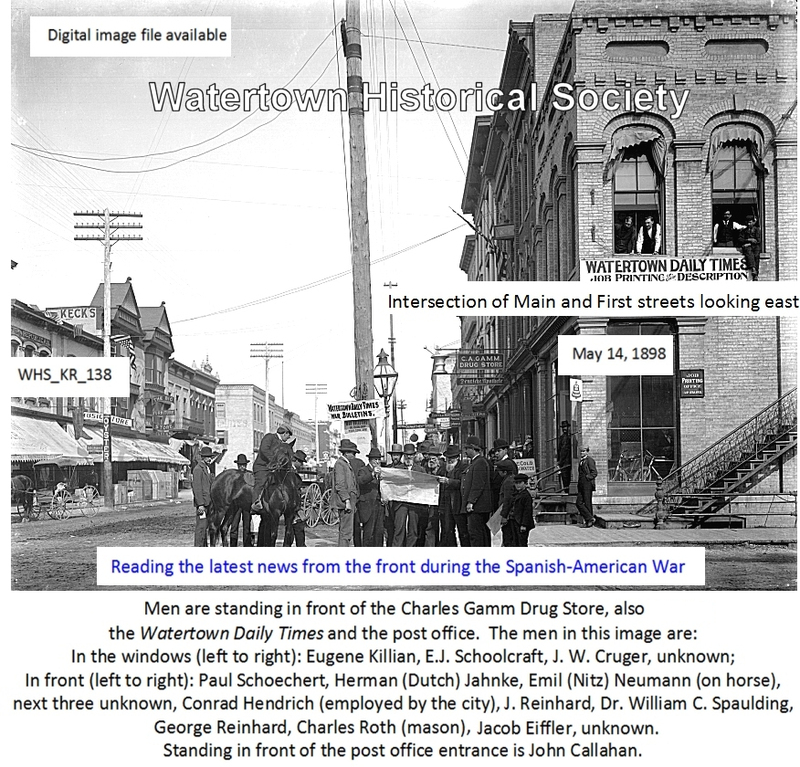 The Watertown Weekly Leader has ordered and will soon install a Model K Linotype machine, which handled in the ordinary was will do the work of five compositors, in the matter of type-setting. 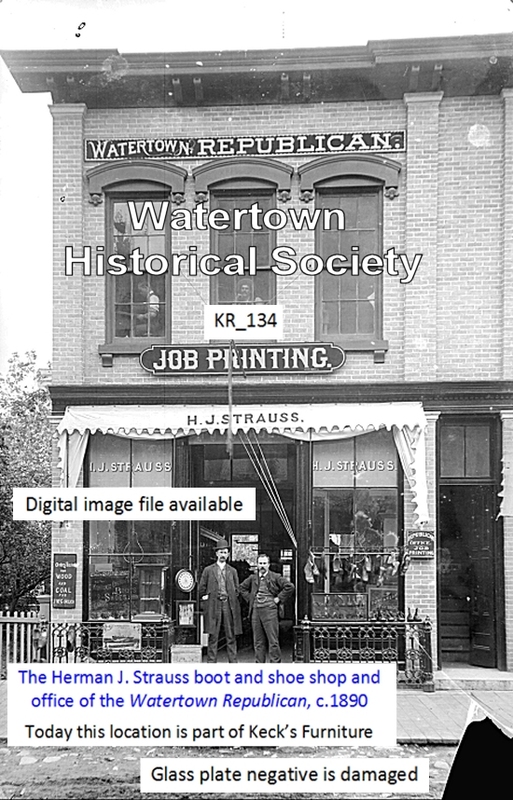 Emil Kehl returned to Watertown [date uncertain], first job was with the Republican, edited by the late Granton Norris.